The Tree of Life features a view of the fire on three sides for a huge 421 square inches of viewing area! The standard double doors can be positioned open (note the finely cast detail even on the inside of the door) or completely removed for unobstructed fire viewing. The advanced log design was specifically made with 180° viewing in mind. Each painstakingly hand-carved log can be enjoyed from any angle. 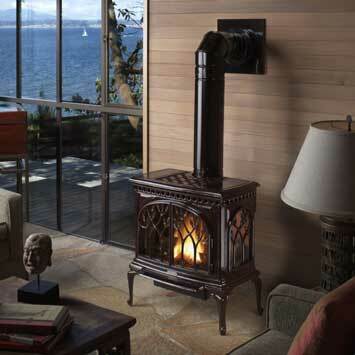 The award-winning Ember-Fyre™ burner presents the most realistic, wood-like fire found in any gas appliance. Unlike other gas appliances, the Ember-Fyre burner will produce an enjoyable fire with glowing embers even at it's lowest flame setting. Our patent pending self-balancing flue system is designed to produce the most beautiful flame with any approved vent configuration (top or rear termination) or under any atmospheric weather condition.